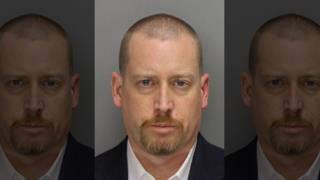 (Newser) – A former Georgia attorney is on the run after allegedly cutting off his ankle monitor, murdering his mother, and fleeing in her Lexus—all while facing 30 years behind bars for other crimes, Fox News reports. Richard Merritt, 44, was about to surrender to authorities Feb. 1 and serve his time when police say he stabbed his mother, Shirley Merritt, in DeKalb County and hit the road, per WSB-TV. "He probably knows people all over the country, being a lawyer," says a US marshal who's hunting the fugitive. "He could be anywhere. We think he may be anywhere in the country." What's the purpose of the two darkened side panels in the picture? So we'll know what he looks like in the dark or through tinted glass? "He probably knows people all over the country, being a lawyer" Because...?